A police officer who responded to a domestic disturbance at a New Hampshire home was shot and killed before the home burst into flames. 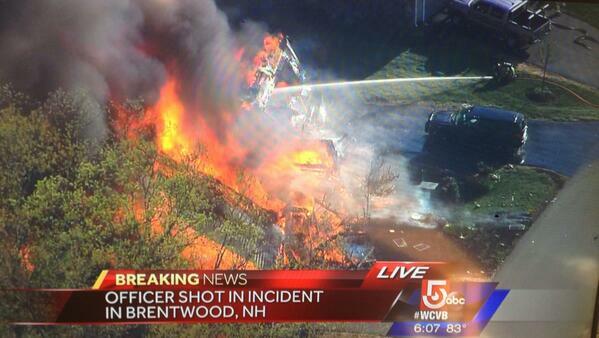 Multiple police officers responded to a report of an officer-involved shooting at a home in Brentwood, N.H., Monday when an explosion occurred. Television footage showed smoke pouring from the upper floor of the home, which was quickly becoming engulfed by flames. Then, without warning, the home exploded around 5:45 p.m. ET. Brentwood police officer Steve Arkel, 48, who responded to a domestic dispute at the home, was allegedly shot by the homeowner's son and flown to nearby Exeter Hospital by helicopter where he died of his injuries. After the shooting, the house burst into flames. The suspect, identified by officials as Michael Nolan, 47, is also believed to have died in the fire and explosion. A third person was also taken to a hospital. 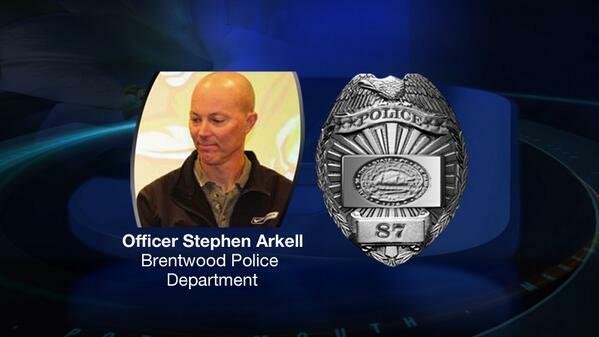 Officer Steve Arkell was a part time officer, who had been with the force for more than 15 years. He was a husband and father of two teenage daughters. Shortly before the explosion, media crews and neighbors were told to get back, out of concerns that the fire might spread. The home that exploded is located at 46 Mill Pond Road in the Mill Pond Crossing community, which was built in 2008 in Rockingham County, N.H. The attorney general's office said it had been informed but was still gathering information on the situation. New Hampshire Governor Maggie Hassan was on site at the state's Emergency Operations Center immediately after the incident. In the evening, she spoke at a news conference, where she said she joined the community in mourning the loss of Officer Arkell.